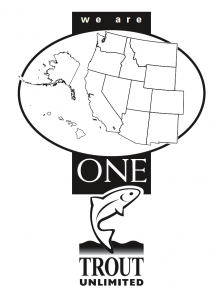 Home / Archive by category "design"
Todays work was a design for one of my clients, Trout Unlimited. 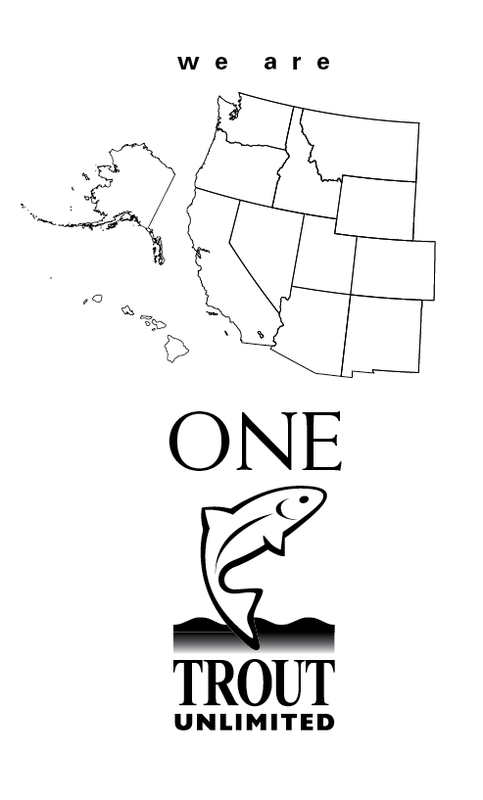 This is a simple black and white design for a T-shirt as they will all meet for a Western Divisional Meeting. The secret (not a secret now) is that you have to gather the elements together in a type of logo design so that the elements do not ‘float’ in the white space. This is accomplished by using reverses on the type, and then creating structural elements (boxes and circles). The final touch is using a mask on the trout and violating borders. This helps to lead the eye around the image without coming to a ‘dead end’ in the visual appearance. In order to show how a little knowledge makes the difference in good and bad design, I am posting the graphic without the two structural elements of the oval and the box. See the difference? Have a great meeting TU West! Our apartment is somewhat small. There is the main living area which is all one room: Living room, dining room and kitchen. Then you go up the stairs and the bathroom is on the right before you go into the master bedroom. So, the ‘office’ (computer, printer, scanner and accessories has to be in the LR. What to do? For a year we had it on a small kitchen table under the main window. Ugly. A few days ago I stumbled upon a corner desk in a thrift store. It is nothing special, and cost me 30 dollars. Since it had to be in my living room, my son John and I started brainstorming about a good configuration. After tossing around a few ideas, we came up with this one. 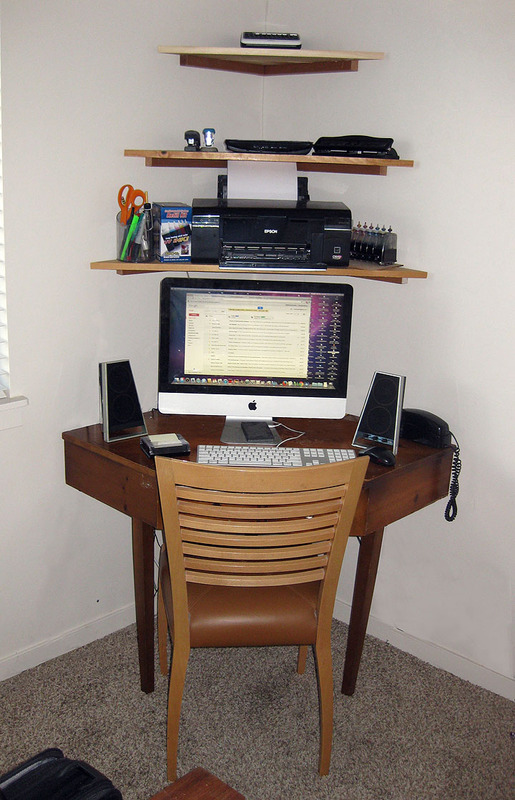 I wanted the look to be more sleek and attractive and less bulky than a regular corner shelf installation, or one of those ubiquitous computer desk stations made out of particle board. So here is our solution. A simple tiered, three shelf install (each wall mounted) without any ugly metal brackets or stupid looking supports. It takes up very little room compared to the kitchen table we had (which always becomes a surface that gathers junk). Coming up with a good corporate or product brand logo is not an easy task. One must consider the type of market (tech, toy, education, etc. ), how it will be used (online, print, packaging, etc.) color scheme, reproducibility, brand conformity (does it naturally communicate a products identity) and more. Over the years I have created brands for various people, companies and projects. Here are some case studies. My brother has a company that did both digital and analog data management with telephones. He needed something that said exactly that. Digital is represented in saw tooth (square) waves and analogue in sine (round) waves. He was the rare breed that did both in the heyday of oncoming digital technology. If you follow the two colors, they intersect at the ‘center’ of the logo, the ‘center’ of my brother’s business, and the ‘x’ in the word exchange describes that point of intersection perfectly. Oh. I forgot to mention. His domain name is DVX.com… not DVE. This logo actually makes you think that his initials are DVX even though it obviously isn’t. In the early 2000’s I created about 400 or so vector illustrations that were geometric designs which are very colorful and are useable in many different ways, especially as textile designs. I also sold a number of them as giclee prints on canvas. The endeavor of floosiga was to be nothing but fun, colorful and entertaining. It was to interest younger children in mathematics; vectors, polyhedra cut-outs and models, explosive color pallets and free wheeling design all in a playful atmosphere. I even had my children creating these works and printed one of each of their own works on canvas for each child. 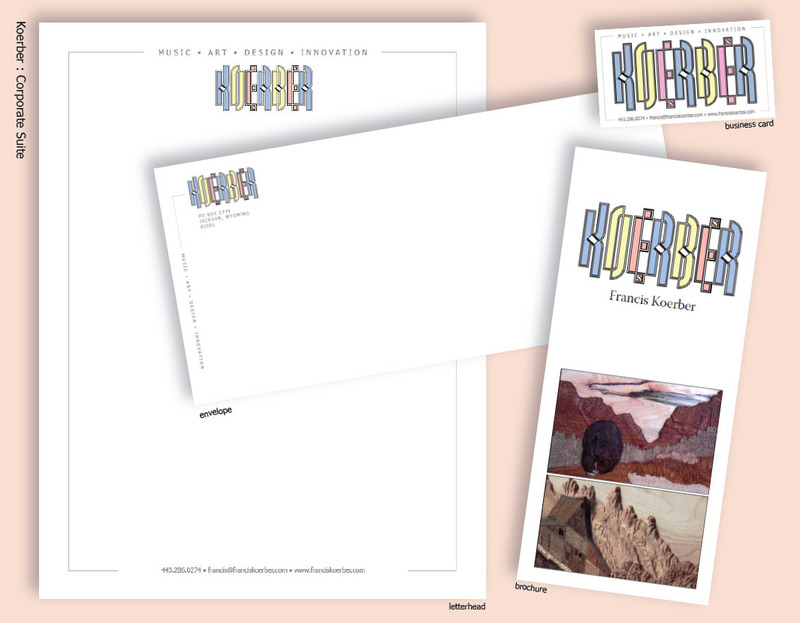 The name ‘floosiga’ is derived from the German phrase ‘Fluesigga Kuensta’, which means fluid or flowing art. This was the three color logo I developed for that endeavor. This case study involved a startup which meant the whole kitten kaboodle: corporate brand, suite, inside and outside store signage, website, labels, etc. The cupcakes each sported a ‘city theme’. Working with Alabanza Corporation, I developed this brand for a web application that allowed corporations to do website crawling with a spider bot to uncover illegal use of their brand name called domain squatting. 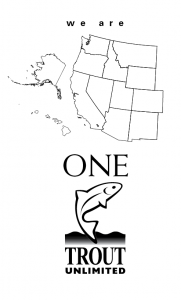 A brand that I created for marketing myself as a performer in Jackson Hole, Wyoming. GUI design for control panel icons within the member user application for managing domain names. This coming Friday is the opening reception for the Jackson Hole Salon Art Show. Therefore, I created this newly designed corporate suite for marketing myself to the locale.